If you can't diet or exercise it off, you can now try to freeze or zap it off. The Food and Drug Administration gave the green light for new weight loss treatments: one that freezes fat cells and another that uses a low-energy laser to shrink them. For those that have a few annoying extra pounds or a bit of a bulge in all the wrong places, Zeltiq, may be the answer. Cleared last week by the FDA as a body contouring treatment, it uses a gel patch attached to a machine that freezes unwanted fat cells, causing them to self-destruct and get re-absorbed into the body over several months. On the market for about a year, the drug was originally approved by the FDA to anesthetize and cool the skin before dermatology procedures. But doctors found that the device worked in the battle of the bulge as well. "This is a big deal," plastic surgeon Lawrence Bass told "Good Morning America." "It's the first time the FDA has cleared a non-invasive fat-reduction technology." Former dancer and avid exerciser Lisa Pittonyak was a Zeltiq customer eight months ago to combat "my lower abdomen little pouch that I have." "It's always bugged me, my whole life," she said. "At first it was a strange pulling feeling, a little painful," she said. "And after about five or 10 minutes, you basically get numb." Although she's only lost about half an inch, she said she feels better about her body and that the $1,500 price was worth it. "Bathing suit, summer time, the jeans, wearing tighter clothing," she said, ticking off the reasons how Zeltiq worked for her. "And not feeling like I have that little bulge." In addition to Zeltiq, the FDA also cleared another weight-loss method called Zerona, which aims a low-energy laser at troublesome areas, forcing the fat cells to empty in a matter of weeks. "They certainly don't replace diet and exercise," Bass said, "but they're another option for a subset of patients that just need to take a little bit off." The FDA clearance can mean a bonanza for marketers who can use that for pronouncement in advertising. 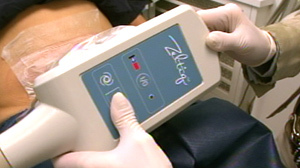 The fat-freezing device has been used "off label" for fat-busting. It's manufacturers have solid scientific evidence to support its effectiveness in freezing on average 22 percent of the fat layer reduction. It's mostly for people of normal body weight with just a few nagging trouble spots. The laser device, in contrast, is the first of its kind to receive FDA clearance which means, while safe, the body of scientific evidence is less robust and less well-documented. But unlike liposuction, these treatments are non-invasive, meaning there's virtually no down time and very little physical risks. New weight-loss treatments are always sought as more and more Americans struggle with expanding waistlines. The FDA is also expected to review a weight-loss pill known as Contrave in December. The drug shows promise: Researchers found that clinical trial participants began losing weight four weeks after starting the drug regimen and lost an average of 6.1 percent of their body fat after more than a year of treatment. But, so far, none of the weight-loss treatments seems to be magic pill. Some have embarrassing gastrointestinal side effects and doctors have continuously stressed that pills and lasers are never meant to replace old-fashioned diet and exercise. CLICK HERE to learn more from the American Society of Aesthetic Plastic Surgery.